Motorola’s vast expansion of its product lineup may be hated by many, but the company is giving us some sizable and worthy products. That’s what happened with every Motorola product launch this year. So far, the Lenovo’s company has launched a total of nine products in India- Moto G5, Moto G5 Plus, Moto C, Moto C Plus, Moto Z2 Play, Moto E4, Moto E4 Plus, and the most recent Moto G5S and Moto G5S Plus. Every lineup has its own unique identity. The Moto C and C Plus are for entry-level buyers looking for alternatives of Xiaomi Redmi 4A and Redmi 4. Moreover, the Moto E4 and E4 Plus are slightly premium models of the Moto C and C Plus. The Moto G5, G5 Plus, G5S, G5S Plus are mid-range products. The Moto Z2 Play is a great upper mid-range smartphone, which is also a modular device. But what surprised many is the existence of Moto G5S and Moto G5S Plus because it has been just six months since the Moto G5 and G5 Plus was launched in the Indian market. The Moto G5S is not a major upgrade over the Moto G5, but the G5S Plus is a worthy successor to the Moto G5 Plus. We’ve purchased the device from Amazon India for Rs. 15,999 on the launch day itself. Read on to know our initial impressions of the smartphone. Motorola priced the G5S Plus in India at Rs. 15,999. The device is available in two color options- Lunar Gray and Blush Gold. We picked the Lunar Gray color variant of the device because it looks much better than the Blush Gold color option. Coming to the design aspect first, the Moto G5S Plus is entirely made of metal. For the unknown, the G5 Plus has a metal back but the side, top, and bottom frames are made of plastic. Motorola learned a lesson and gone with a complete metal body, which is on par with other budget smartphones such as Xiaomi Redmi Note 4, Lenovo P2, Honor 6X, etc. Also, the G5S Plus feels more premium than the G5 Plus when taken into hands. Coming to the display aspect secondly, the G5S Plus has a bigger 5.5-inch display, but the resolution of the smartphone is still at 1080 x 1920 pixels. The pixel density of the G5S Plus is reduced to 403 PPI from 424 PPI seen on the G5 Plus. The display on the G5S Plus is slightly better than the G5 Plus. This is where the major upgrade can be seen. The G5S Plus is the first Moto smartphone to come with dual cameras to the Indian market. The phone has two 13 MP sensors at the back, which is coupled with a dual-tone LED flash. The front-facing camera is also upgraded to 8 Megapixel from a 5 MP shooter seen on the Moto G5 Plus. Take a look at the camera sample below. There are not many differences in the hardware specs for the Moto G5 Plus and Moto G5s Plus. They are powered by the Qualcomm Snapdragon 625 chipset clocked at 2.0 GHz and come with Adreno 506 GPU. In India, the G5S Plus comes in a single 4 GB RAM and 64 GB storage variant. Also, the battery capacity in the phone is still at 3000 mAH. The software side of the matter, the G5S Plus has the latest Android 7.1.1 Nougat with June 2017 security patch update installed. 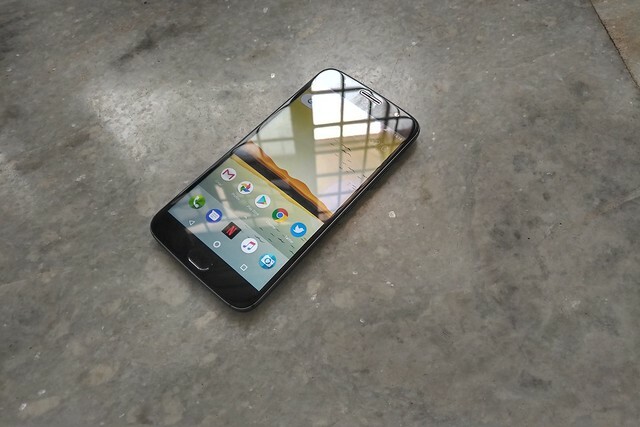 The Moto G5 Plus is stuck on Android 7.0 Nougat. This is where the major upgrade can be seen from Moto G5 Plus. The G5S Plus is the first Moto smartphone to come with dual cameras in the Indian market. The phone has two 13 MP sensors at the back, which is coupled with a dual-tone LED flash. The front-facing camera is also upgraded to 8MP unit from a 5 MP shooter seen on the Moto G5 Plus. In good lighting conditions, the G5S Plus performs well with images having all the details. The images are on par with the G5 Plus’s 12 MP camera. However, the camera doesn’t produce decent images in low-light conditions. This is where the lack of smaller f/1.7 aperture comes into play. Images Below are taken in the Day light condition and they are really impressive. The dynamic range and details are also good with the Moto G5s Plus camera. The low-light performance of the G5S Plus is not as good as we have seen on the G5 Plus. The primary aspect- the secondary sensor is used to capture depth in the images. There’s a dedicated depth sensor as well, which doesn’t work that great, even in good light situations. Overall, the depth sensor is a hit or miss in the Moto G5S Plus. Initially, Motorola did not offer any depth choose mode when capturing the image. But a recent update to the camera app added that feature. Also, there’s a dedicated depth editor mode where you can edit with options such as selective focus, replace the background, and selective B&W. The camera app itself is laggy, and Motorola needs to update it to improve the performance and speed. Motorola’s first dual camera smartphone is okay but some more updates and refinements are needed for the Dual camera. The videos from the camera are less shaky and come with a good amount of details and the microphone also picks up sounds well. Being powered by the energy-efficient Snapdragon 625 chipset, the Moto G5S Plus offers excellent day-to-day performance. And coupled with 4GB of RAM, multitasking is a breeze as well. However, Motorola’s memory management is aggressive as the G5S Plus doesn’t keep more than 10 apps in the memory. There are some interesting UI features like the One Button fingerprint navigation, chop 2 times to open the flashlight or twist your wrist to open the camera App without unlocking the device which are really handy in day to day use. The audio via the loudspeaker is not very loud as well as it doesn’t fill a closed room, but sufficient enough to hear the other person talking. The device runs stock Android 7.1 Nougat with June 2017 security patch on top. It did not receive any software update in the entire period. Gaming wise, the G5S Plus handled all the heavy games with such as Asphalt 8, Dead Trigger 2, and Mortal Combat 5. You can install more games, thanks to the 64GB internal storage. The benchmark scores are pretty standard and these are also the scores achieved by other Snapdragon 625 smartphones. The G5S Plus comes with a 3000 mAh non-replaceable battery. The battery life is decent, similar to other Snapdragon 625 devices. The phone offered a screen-on time of more than four hours every day with intensive usage, which is very decent. Also, it comes with Turbo Charge support which fully charges the smartphone in just 90 minutes. We are quite impressed with the charging speed and time is taken to charge the smartphone and the battery also holds the charge without any apps misbehaving to drain it. The Moto G5S Plus now has a very tough competitor in the form of Xiaomi Mi A1, and both the phones are a very good option in the sub 15k price range. This is the first Motorola smartphone with Dual cameras, while the camera is good for daylight struggles a lot in the evening or night shots. The video recording from the camera is good and details are evident when you playback the footage on a big display. The camera comes with the option of recording 4K videos as well. Front selfie camera is also decent with its 8 Megapixel lens and can take good shots in the daylight condition. The gaming performance and overall UI and UX is smooth and we did observe that the G5s plus gets warm after some time of playing games and that is common for most metallic phones. Overall it has a great build quality and design plus added advantage of good service from Motorola. I am also doing testing for the Xiaomi Mi A1 parallely and it is an impressive phone, would be sharing a detailed review in a couple of days. Also, I would suggest you read about Moto G5s Plus Design, Display, camera, and Initial thoughts here – Motorola Moto G5S Plus First Impression – A Good Camera Phone. So you get a good background of the Moto G5s basic features and design.